After many years of facilitating proposals in our beautiful city of Savannah, I believe we have finally found a way to help you to create and capture a truly enchanting moment in your life. Many people think that finding the one you want to spend your Happily Ever After with is the hard part, but after working with so many on proposals, it seems that getting IT right is the most stressful! We have never offered a proposal package in the past. But now we have created something wonderful that will document the whole event so you can treasure it always, and even post it right away! You will be picked up by horse and carriage at a location within the Historic District and taken for a romantic ride through the City. Your driver will narrate a 45 minute tour, which will include some of Savannah’s greatest love stories. Near the end of your tour we will deliver you and your bride (or groom) to be, to one of the many squares that have a fountain. Don’t worry, we have a great excuse prepared for you to get off the carriage. Now you may propose in front of one of the City’s Iconic back drops! As you propose, we will have a photographer capture this priceless moment in real time for you, but from a discreet distance, so your fiancé to be, will be completely surprised! The carriage ride itself is 45 minutes. 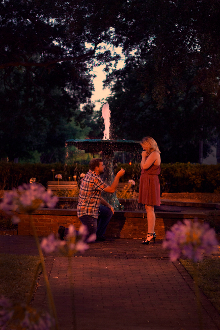 From the time you arrive in the square to propose, you will have up to a total of 30 minutes with the photographer (including the actual proposal). You will have some time for additional photos following if you would like them. We will include 6 high resolution photos, which we will email to you within 7 days of the shoot. This is to allow the photographer time to make edits and forward the photos to you. Additional shots, or copies of photos on disk, or thumb drive can be purchased as well. We will send you one photo the day of your proposal, within approximately 1 hour of parting ways. (Please note, this photo will be unedited). Then, you can Text, Tweet, Instagram, Facebook, or smoke signal your good news to the whole world! We can always tailor this experience to make it fit you just right, but we are VERY excited to offer what we think is a perfect answer to “How am I going to do this”! *Due to the additional planning and details required to book this package, we ask you book a minimum of 7 days in advance. We will need to time to book the photographer and to orchestrate any additional details you wish to include. Any expenses for flowers, or other items you might like to include, will be an additional cost. *This package is for two passengers only. Cancellations for this package must be made a minimum of 24 hours in advance to receive a refund. *We will schedule your tour time with you based on your needs and our availability. You may also call to schedule. Copyright © 2014-2019 Carriage Tours of Savannah. All rights reserved.